I’m currently reading Revelations of Divine Love, by Julian of Norwich (1373). Nobody knows Julian’s real name or where she began, and most other details are based on conjecture. But we do know she wrote some of the greatest prose of her time, and was even the first woman to write a book in English (as far as anyone can tell). What fascinates me particularly is that the book opens as a spiritual memoir – a genre very close to my heart. I confess the above is not a picture of Julian. We don’t know what she looked like, as she doesn’t tell us. There is a modern statue of her at the entrance of Norwich Cathedral, but I can’t picture her so troubled and stony as that. She often uses the word ‘homely’ in her writings, so I see her as plumpish, rosy, and as sanguine as anyone dared to be in those days. 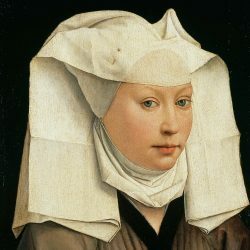 This is just a painting by Rogier van der Weyden from around Julian’s time, which Penguin have adopted for their cover. As an unknown Dutch woman, it’s otherwise irrelevant, but it does seem to have a little more about it. The Church in Julian’s day was far from sanguine, and wasn’t much interested in women’s rights either. It was steeped in national politics, fixated on sin and hell to frighten peasants and keep them subordinate. Only a fifth of men would have been able to read, and far fewer women. Most teaching was received via sermons and paintings in church, so the religious imagery was often gruesome and menacing. Many of the literate were part of the Church, and would thus have used Latin. Heretics were burned at the stake for even reading the Bible in English. So for a woman to write at all, let alone on religious matters – and in English, the language of the masses – was not only astonishing, but also dangerous. Add the fact that Julian experienced God as an unconditionally loving parent, with both ‘male’ and ‘female’ qualities, and it all becomes terribly shocking. God came to her as powerful and omnipotent, but equally as nurturing, reassuring, ‘homely’ and compassionate. She even uses the term ‘meek’ in certain cases. Until the age of thirty, Julian (whatever her name was then) lived as a laywoman, and was probably from quite a privileged background. She then fell seriously ill. Barely able to see, and with paralysis creeping up her body, she surrendered herself to the seemingly inevitable. A priest was called to administer last rites, and as part of the ritual held a crucifix up to her face. The wooden figure came to life before Julian’s eyes, and there followed a series of vivid and detailed visions, replete with teachings: in words, images and inner realisations. These form the basis of her sixteen Revelations. From the time of her visions until death in her early seventies, our heroine lived as an anchoress, never leaving the cell attached to her namesake, St Julian’s Church. Her room had no doors, but three windows: one opening onto the church for services, one for supplies and waste, and another facing the street. There she would have met with people from wealthy and lowly backgrounds alike, offering her counsel. No doubt she formed some careful friendships in this way, and her writings thus found a secret audience. After Julian’s death, the manuscript seemed to disappear, perhaps hiding here and there in wealthy homes and monasteries, but between the Reformation in the 15th Century and the French Revolution in the 18th, many such copies were no doubt destroyed. Mysteriously, at the start of the 20th Century, Grace Warrack came across a copy in the British Library, hand-written by 17th Century nuns. She translated it from its original East Anglian dialect to more modern English, and further modernisations by other editors have followed since. Many thanks to Bhashini for recommending The Search for the Lost Manuscript – a BBC documentary by Dr Janina Ramirez. But for that, I would probably have never started reading Julian’s works, and would know very little of her history. It’s an amazing wealth of research, compellingly presented. It kept turning in my mind, and I realised how much power it had amidst the struggles and disappointments of daily life, not to mention the constant barrage of devastation one hears in the news. Its context is Julian questioning why sin had to be created in the first place, since everything is made by God. And thus, in my folly, afore this time often I wondered why by the great foreseeing wisdom of God the beginning of sin was not letted: for then, methought, all should have been well. This stirring [of mind] was much to be forsaken, but nevertheless mourning and sorrow I made therefor, without reason and discretion. But Jesus, who in this Vision informed me of all that is needful to me, answered by this word and said: It behoved that there should be sin; but all shall be well, and all shall be well, and all manner of thing shall be well. She questions Christ further, troubled by the thought of those who have died as heathens and cannot be saved according to the Church, thus condemned to eternal damnation. In our day I may occupy myself by wondering “without reason and discretion” how we will avoid another Cold War (or a not-so-cold one), or how my country will thrive outside the EU. Either way, whatever seems impossible to us is not so to God. And as to this I had no other answer in Shewing of our Lord God but this: That which is impossible to thee is not impossible to me: I shall save my word in all things and I shall make all things well. Thus I was taught, by the grace of God, that I should steadfastly hold me in the Faith as I had aforehand understood, [and] therewith that I should firmly believe that all things shall be well, as our Lord shewed in the same time. Precisely because He is all Love and all Goodness, God will never allow mankind to destroy this beautiful world of His. Sleeplessly He tells us to claim His world as our own, and to serve Him in this world by increasing the purity and divinity of our lives…. “We must remember that the Creator is always more powerful than His creation. The Creator can easily influence or change the negative and destructive forces in the world. Our Beloved Supreme could stop a pending nuclear disaster, for example, by changing the mind of the pilot who was about to drop the life-devastating bomb. So we must have faith in our Creator and trust that He will, without fail, do the needful for His creation. But I saw not sin: for I believe it hath no manner of substance nor no part of being, nor could it be known but by the pain it is cause of. And thus pain, it is something, as to my sight, for a time; for it purgeth, and maketh us to know ourselves and to ask mercy. For the Passion of our Lord is comfort to us against all this, and so is His blessed will. To me, sin is a kind of imperfection or ignorance. It is not necessarily something very bad, ugly or untouchable. In the process of evolution we are aiming at perfection, but right now most of us are still wallowing in the pleasures of ignorance and self-indulgence. Each self-indulgent action of ours is a manifestation of our present ignorance. As long as we remain in ignorance, we will do things wrong, we will commit sins. But we must not feel that we are completely lost or covered in darkness. We are just progressing from less light to more light, and ultimately to liberation from ignorance-imperfection-sin. And notwithstanding all this, I saw soothfastly that our Lord was never wroth, nor ever shall be. For He is God: Good, Life, Truth, Love, Peace; His Clarity and His Unity suffereth Him not to be wroth.… For our soul is so fully oned to God of His own Goodness that between God and our soul may be right nought. All this was shewed in these words: Art thou well pleased? – and by that other word that Christ said: If thou art pleased, then am I pleased;—as if He said: It is joy and satisfying enough to me, and I ask nought else of thee for my travail but that I might well please thee. And in this He brought to mind the property of a glad giver. A glad giver taketh but little heed of the thing that he giveth, but all his desire and all his intent is to please him and solace him to whom he giveth it. And if the receiver take the gift highly and thankfully, then the courteous giver setteth at nought all his cost and all his travail, for joy and delight that he hath pleased and solaced him that he loveth. Plenteously and fully was this shewed. Julian’s Revelations are soothing to the mind and comforting to a heart that recognises the truth in them. I find solace in that line, “…all shall be well, and all shall be well, and all manner of thing shall be well,” because it reminds me of how I feel after a good meditation, when the mind and body are calmed, when action – mental and physical – no longer seem so urgent. One realises how little can actually be solved by doing, and how much by being.